For all the talk of e-government, citizens’ access to government at all levels, Federal, state, and local, is becoming increasingly dependent on having internet connections. As a way to cut costs, directing people towards websites and digital information has been highly successful, but that access that information requires digital access. 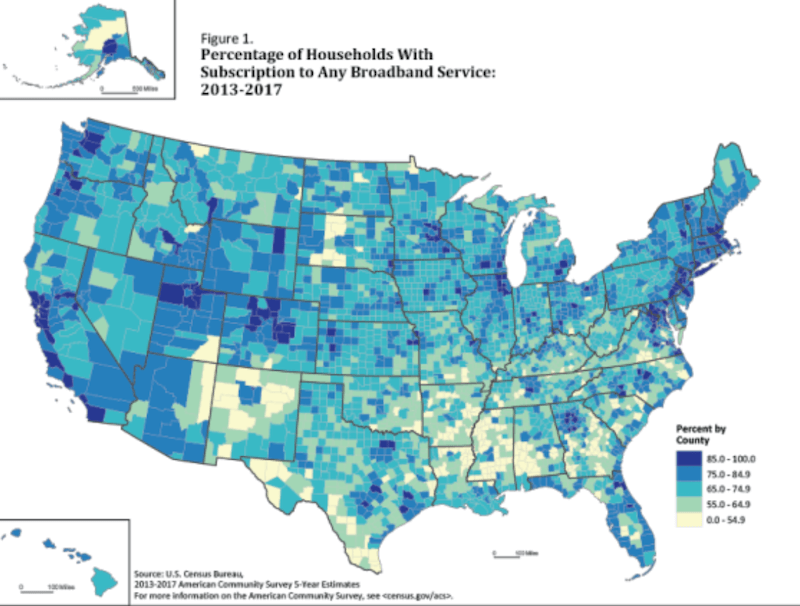 Newly released information from the U.S. Census Bureau shows that access to digital information via broadband internet connections is widespread but that counties with higher subscription rates tend to be in or around urban areas, especially those along both coasts. The 2013-2017 American Community Survey (ACS) estimates released show overall widespread subscription to the internet throughout the country. Nationally, 78 percent of households subscribe to the internet, but households in both rural and lower-income counties trail the national average by 13 points. The agency does point out that their data show that Americans connect to the internet in a variety of ways, including through high-speed wired connections at home and cellular data plans while on the go. The bureau defines broadband internet subscriptions as any service that is capable of delivering faster speeds than “dial up” — no longer used by most, but still used by less than 1 percent of households nationally. While cellular data plans using apps can offer some level of access, completing more complicated forms and downloading larger datasets still require use of computers with screens larger than is possible on a cellular telephone. This places households without broadband internet subscriptions at a marked disadvantage when it comes to accessing educational resources, job hunting, or dealing with more complicated issues. According to the Census Bureau news release, higher subscription rates are found throughout the greater Washington, D.C., area, New York, and Seattle, among others. Focusing on counties with at least 10,000 population (for which statistics are more reliable), Douglas County, Colo., had the highest rate of subscription at 94.6 percent. Loudoun County, Va.; Howard County, Md. ; Fairfax City, Va.; Kendall County, Ill.; and Fairfax County, Va., also all have subscription rates of 92 percent or higher. Counties with lower rates of subscription are prominent throughout the South, especially in the Mississippi River basin, as well as in a number of counties in the Midwest and West. Telfair County, Ga., has the lowest rate of subscription at 24.9 percent out of counties with populations of 10,000 or more. Holmes County, Miss. ; Kemper County, Miss. ; Apache County, Ariz.; Monroe County, Ala.; McKinley County, N.M.; and Leflore County, Miss., all also have subscription rates at or below 40 percent. Since the 2007-2009 recession, state and local government employment has never recovered to the extent of the private sector, while demand for services continues to increase, so it is not surprising that governments have turned to the internet while closing local offices. Government Employment (Federal, State, and Local combined), 2008-2018. Largely as a result of cost-cutting measures, Federal agencies are placing their information online and expecting citizens to access their websites to both learn about Federal programs and to apply for them. The old Government Printing Office, responsible for publishing the Federal Register and the Congressional Record changed its name to the Government Publishing Office back in 2014. And the challenges of placing government services online rather than accessing them in person is as great or greater for state and local governments. Ironically, services for lower income families, those least likely to have internet subscriptions in their homes, are increasingly being put online. In Georgia, home to the county with the nation’s lowest subscription rate, the state has begun Gateway, a new online eligibility determination system for a number of social benefit programs including Medical Assistance, PeachCare for Kids, Child Care Services, Food Stamps (Supplemental Nutrition Assistance Program-SNAP), Women, Infants and Children (WIC), and Temporary Assistance for Needy Families (TANF). This assumes a level of digital knowledge and broadband access that still is beyond many low income families, which are the ones Georgia’s Gateway is designed to serve, and Georgia Gateway is only one example of how states have moved to placing their services online. Low rates of broadband internet subscriptions remain a challenge in some geographic areas that government cannot ignore even as it wants to move services online in our current digital age. Have You Checked Your Cable Bill Recently?